Yorkshire 4x4 Response is a group of keen 4x4 owners who wish to use their vehicles to assist the wider community in times of need. We are affiliated to the National 4x4 Response Network, which is made up of similar groups across the UK. We offer assistance as required by user organisations, such as Police, Ambulance, Doctors, Local Authority etc. This is often in extraordinary circumstances, such as extremes of weather, such as heavy snow or flooding. Membership of Yorks Lincs 4x4 Response is open to anybody who is willing to help. You do not need to be an experience off road driver, or even own a 4x4. To operate successfully we also need a network of supporters, fund raisers and other volunteers. Yorkshire 4x4 Response started under the name Humber-Yorks 4x4 Response. Not very long after formation in 2007 the group's services were called on to assist in the summer floods of that year. In addition to helping locally in Humberside and South Yorkshire there was call for assistance from Gloucestershire to assist local 4x4 Response Teams in Operation Aquarius; aiding the Red Cross in delivering water to key sites. The group continued to expand in number, and following requests for coverage in Lincolnshire, the county was added and in January 2009 the group name was changed to Yorkshire 4x4 Response. The area covered amounts to one sixth of England and about 5.6million people. 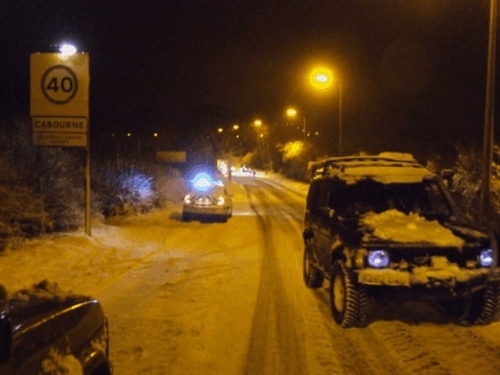 We have been active in the snow and ice, assisting Lincolnshire Police get over 100 motorists moving in February 2009. More recently the severe weather of January 2010 resulted in more than 102 separate call-outs, ranging from stuck ambulances to getting emergency controllers, nurses and doctors to and from work. National 4x4 Response is an organisation that acts for all of the 4x4 Response groups across the country, representing the groups at a National level, to government and other large organisations. National 4x4 Response also acts as an umbrella charity, achieving charity status in 2008, acknowledging the voluntary and charitable work done by the organisation. If you would like further information about the group, please contact us.